Engine control module (ecm) reprogramming to reduce the delay in rpm drop between shifts with the air conditioner on. Ecm (engine control module) reprogramming for warm ambient cold start stumble (wacss) and engine hesitation at approximately 3800 rpm. Fuel pump replacement. *mr service campaign t13. Service information for sulev (super ultra low emission vehicle) elantra (only applied on elantra vehicles with california emissions specification and automatic transmission). Campaign 061 provides the procedures for repositioning the rear brake tubes to prevent contact with the front suspension crossmember's steering gear box mounting brackets. The spring-loaded door (flapper valve) in the fuel filler neck has been deleted certain vehicles. Fuel pump installation for a rough running condition. Service information for sulev elantra (only applied on elantra vehicles with california emissions specification and automatic transmission). Automatic transaxle harsh and/or delayed upshift or downshift - gds analysis. Automatic transaxle harsh and/or delayed engagement into drive or reverse. Automatic transaxle diagnostic trouble codes (dtc) list. Resetting automatic transaxle adaptive values. *sc automatic transaxle control module - reset and relearn adaptive values. Automatic transaxle harsh and/or delayed shifts. to include 2005 elantra. Automatic transaxle harsh and/or delayed engagement into drive or reverse. 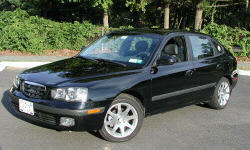 to include 2005 elantra. Automatic transaxle diagnostic trouble code (dtc) p1723 accompanied with malfunction indicator lamp (mil) illuminated; transaxle held in 2rd gear fail-safe; harsh shifts into reverse or drive. Ata solenoid diagnostic trouble codes p0740, p0741, p0742, p0743, p0750, p0755, p0760, p0765, p0770. Ata solenoid diagnostic trouble codes p0740, p0743, p0750, p0755, p0760, p0765, p0770. Fd46xg pag oil specifications for air conditioning component replacement. Resistance values for idle speed control actuator (isca). various models including the 2004 sonata. Generator change for the 2.0l engine. 2.0l engine mfi control system etm revision (ignition coil connector change). Fuse #1 blown - electrochromic (ec) mirror wire harness short. Power door lock actuator circuit etm/shop manual correction. Corrosion in the front door wiring connector. this bulletin supersedes 01-90-004. Interior door trim panel fabric repair. Door frame black tape replacement procedure. 2003 shop manuals and etms on webtech. Procedure for replacement of the front seat track recliner cable. High pitched wind noise related to front door weatherstrip.